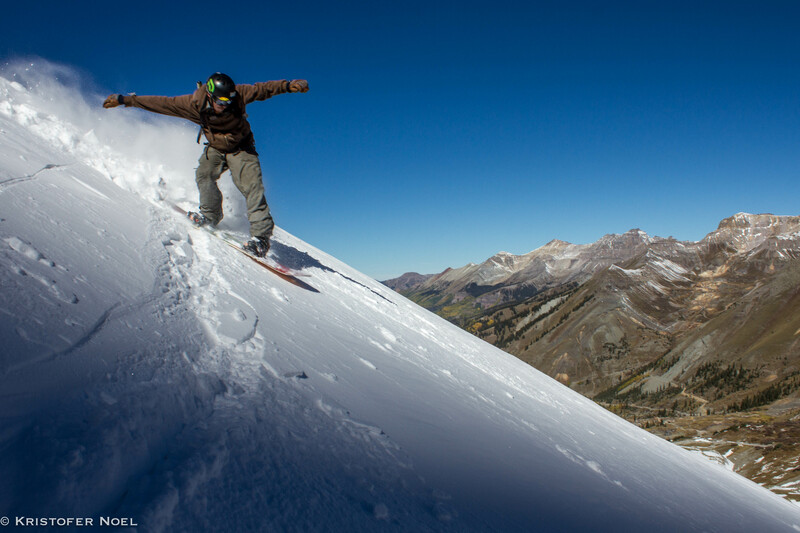 Consistency is important in skiing as it is in life. 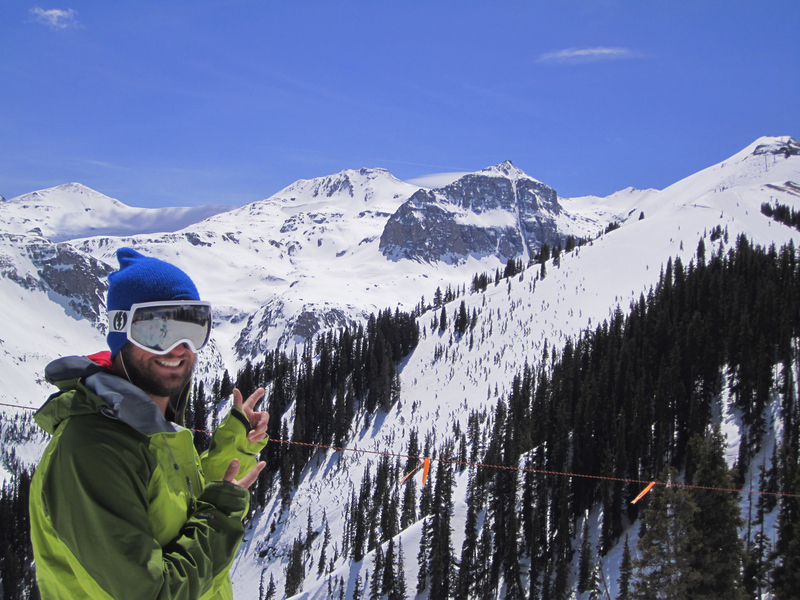 While I haven’t achieved that in writing blog posts I have in my skiing. 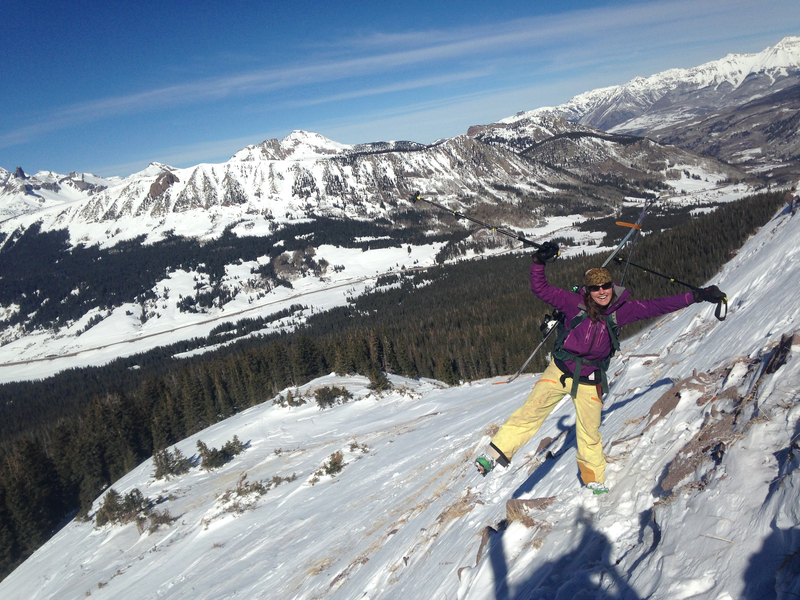 Yesterday was Sunday Funday, and a group of friends and I decided on an objective to climb and ski, Sheep Chute on Sheep Mountain 13,292′. We set our car shuttles and began the skin through the forest and up to tree line. The wind was howling and we’ve been in a high pressure pocket for what seems like weeks. 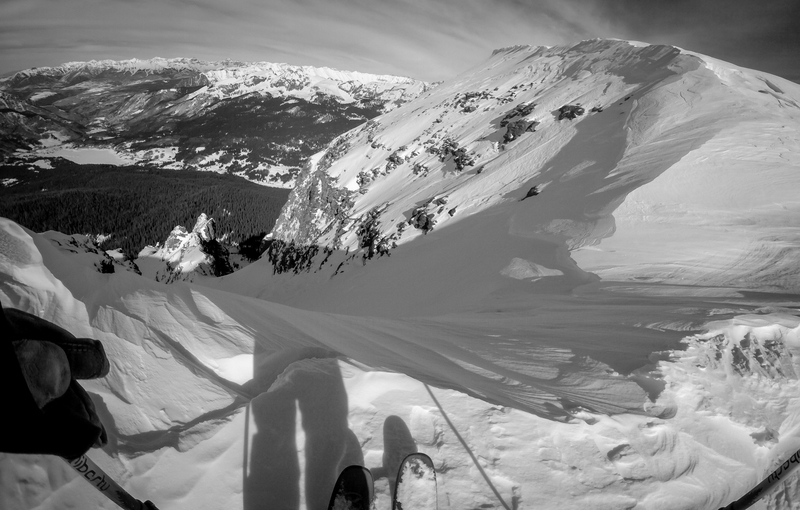 This has allowed cold nights and warm days, the wind had ample faceted snow to transport and hard wind slabs were a plenty. All of which were highly touchy and reactive, certainly a good time to watch your step, plan your route and talk openly amongst the group. Crossing a small slope we set off a slab that propagated wide across two drainages and quickly stepped down a layer; fortunately our route was fairly well chosen and we were able to scramble and slide to a “safety spot”. 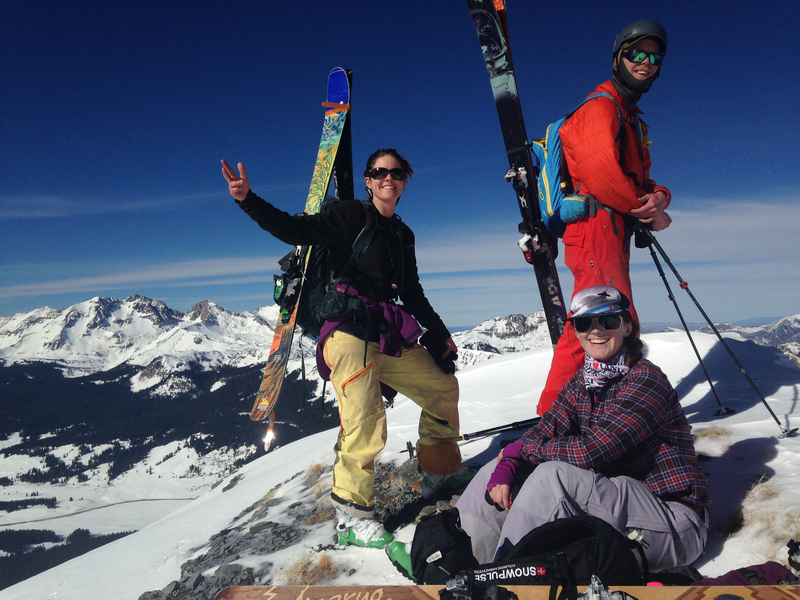 We decided to put the skis on the pack and scramble up rock to avoid the touchy slabs. This proved to be a safe choice and offered us the opportunity to go straight up the hill and gain the ridge as quickly as possible. Once we got on the ridge there was a collective increase in happiness and confidence grew, we knew that we only had a few hundred feet of elevation on a somewhat sketchy ridge to reach out objective. Snow on the ridge was some of the most wind effected I’ve seen, to put it simply it was horrible. 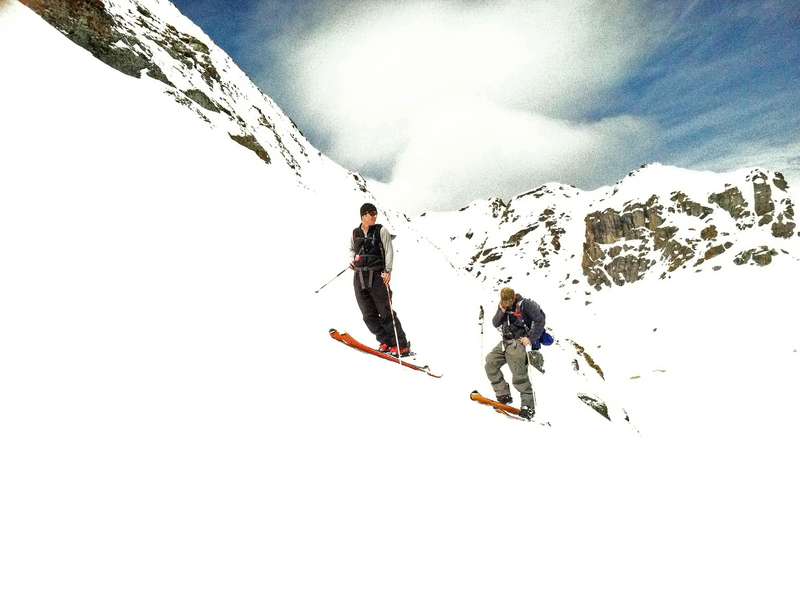 Would this be a sign of the conditions in the couloir? Probably. The view and experience of having 2,000′ of exposure to your left and right with a horrible traverse is attention grabbing and rewarding. Truly nothing crazy compared to what my peers in the San Juan Mountains frequently accomplish but great none the less. Things smoothed out on the traverse after the hight point of the ridge, the winds were quite strong and perhaps a sustained 25-30 mph with higher gusts. The winds were coming up and over the objective of our ski. 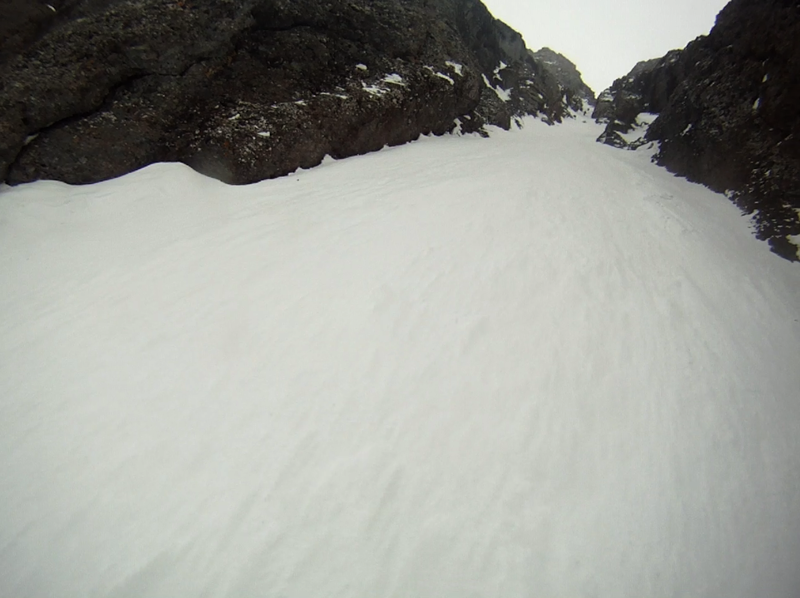 This is opposite of the past few weeks and was blowing the opposite direction of the ridge line cornice. This left a small amount of concern for the giant south facing drop to our right, this is a 2,000′ ride we did not want to take. 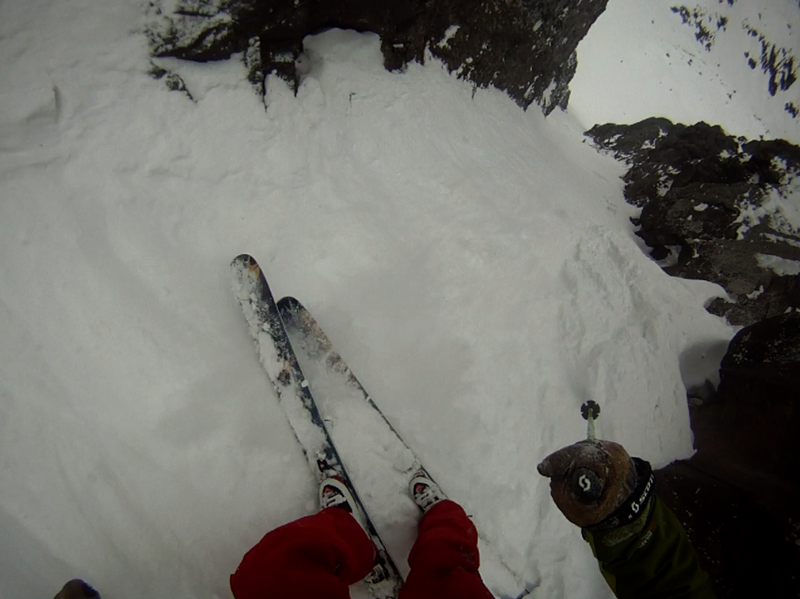 The entrance was absent of a cornice and provided easy access into the first leg of the couloir. The first few turns resembled more of a World Cup GS course that that of a powdery run of your dreams. 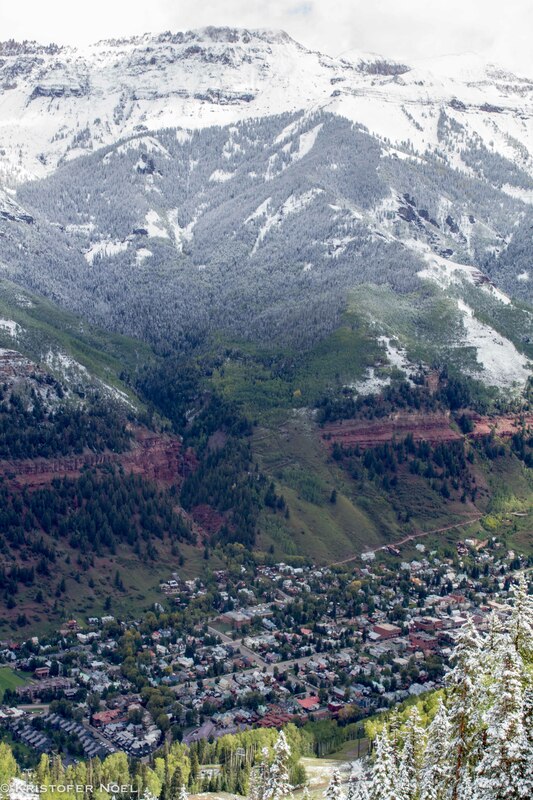 This tends to be the case above 13,000′ in most of the San Juan Mountains right now, we need snow. 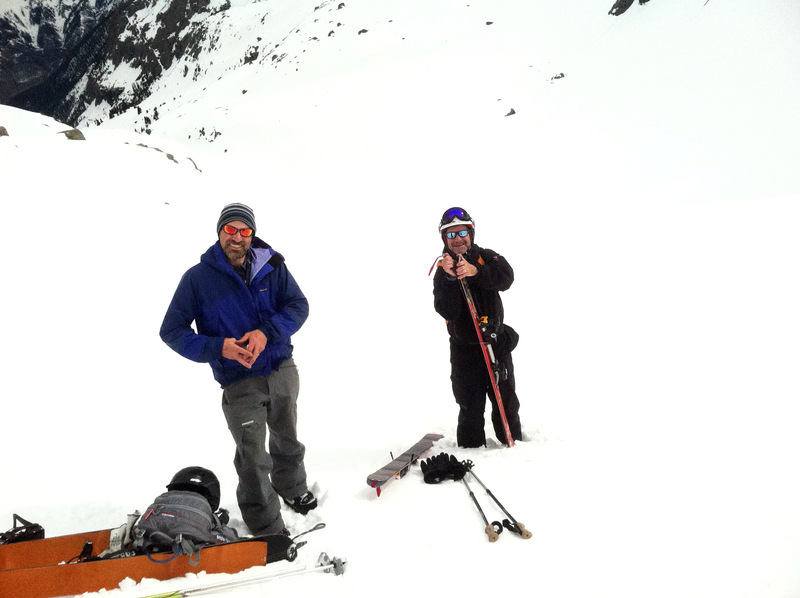 With the rest of the crew on a ridge acting as a safety skiers left between the first and second section of the couloir I ski cut the second pitch then took off down the fall line. 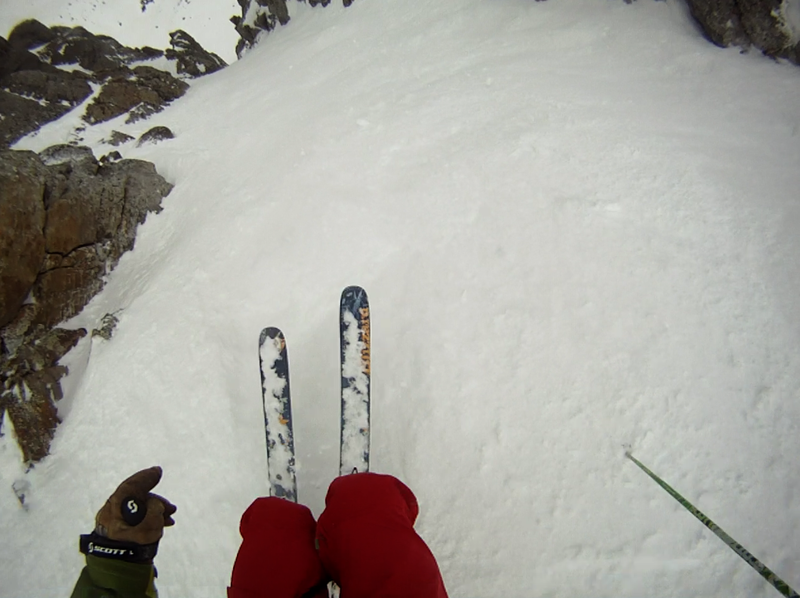 The center of the hallway was quite firm, the right side breakable crust that wanted to swallow your ski and perhaps tear parts of your ACL along the ride. The left was a mix of recycled snow blow in on top of breakable crust. Conditions were variable to the max, they sucked. 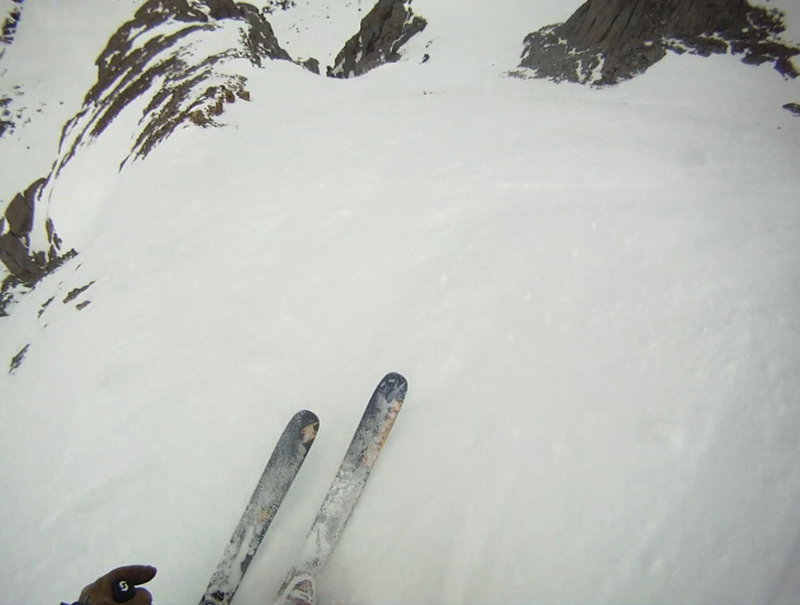 Looking back up the massive hallway of the couloir was quite rewarding with a strong burn in my legs. I was pumped that my last few turns on the apron resembled round turns; I assure you my turns in the middle of the run didn’t, they were lacking any beauty to say the least. Survival skiing was the name of the game. Fortunately the line isn’t all that steep, perhaps your average resort “black to double black” and I believe we were all grateful that was the case. On the way out we were able to ski low angle powder in a few other aprons of giant bowls above. There were a few reminders that even with a “moderate” avalanche report rating and fairly stable snowpack that all it takes is to tickle the dragon in the wrong spot and she’s awaken with a fierce vengeance. This slide ran fairly wide and a long ways down the apron. Always a good reminder to keep your head on a swivel and travel options open. Good times with good people are what it’s all about. A safe and wonderful ski tour, with a great group of guys and girls, Sunday Funday! 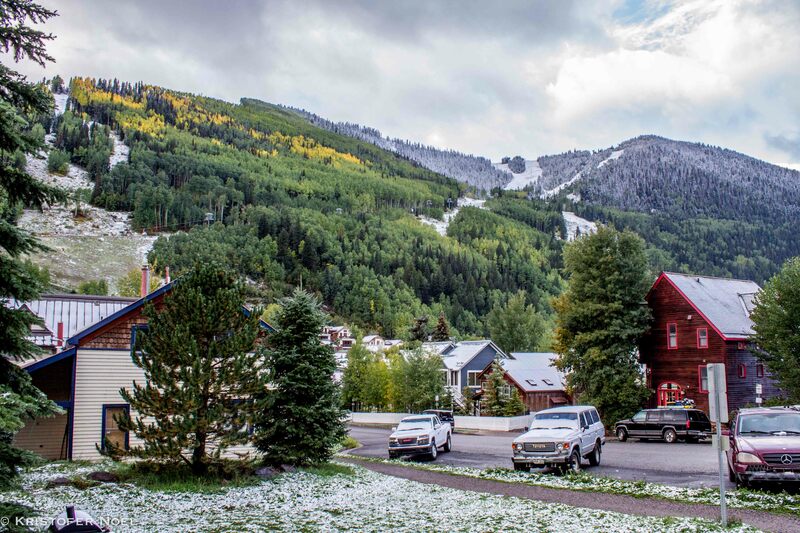 I must admit, I’ve never skied in September. I’ve ridden my bike in the snow, I’ve thrown snowballs and I’ve enjoyed September surf sessions, but I’ve never skied in the month of September, until today. Luke and I were certainly happy with the outcome. Spirits were high as we left town early and began the drive into the high alpine. What we were looking for was shaded North facing slopes with enough wind deposited snow to make it count. What we found was exactly that, with surprisingly cold and dry winter snow. 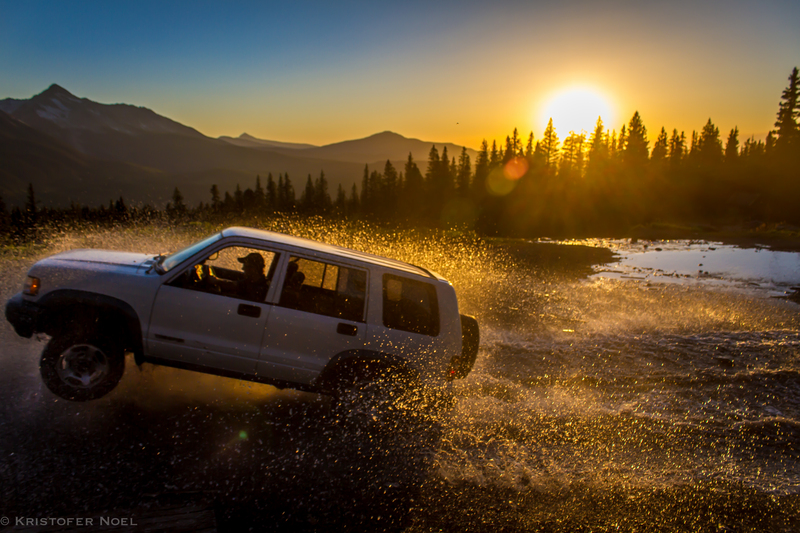 Autumn in the San Juans, scratch that…life in the San Juans is so good. Live Life to the Fullest and Love with Your Whole Self! The temperature dropped and the winds picked up as the sun tucked away behind the mountains to the west. I knew that in a few short hours the cold fat flakes would begin to accumulate. 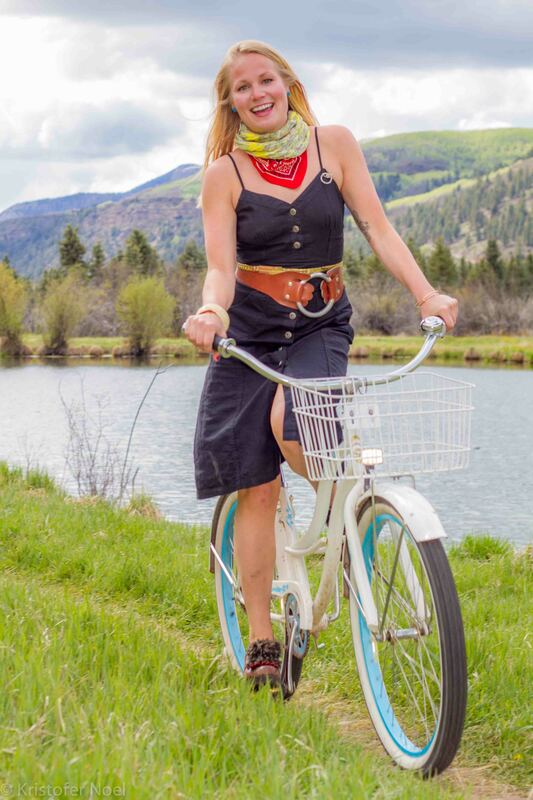 The vibe around town this morning was filled with big smiles and spirits were high as everyone enjoyed a perfect autumn day in the San Juans. The only question that remains; will the rest of the leaves turn in the next few days, or simply fall to the ground? It’s dry, very dry here in SW Colorado. We’ve had wind, warm temps and zero precipitation. The snowpack has dwindled to all but nothing and dust has taken over. While on a vehicle assisted mountain bike adventure I snapped a few photos as the sun did it’s thing over the west side of the earth. It’s dry out there, please be careful. The smoke from a forest fire drifting over the La Sal Mountains of Utah as the sun set is a reminder. It’s pretty but it’s also serious. I usually say pray for snow or surf…today it’s rain. I spent a little time with a few friends yesterday shooting some photos around town. We took advantage of great lighting and did a bit of a walking tour, biking tour and shooting tour. Sunny one minute, snowing the next, got to love the mountains. 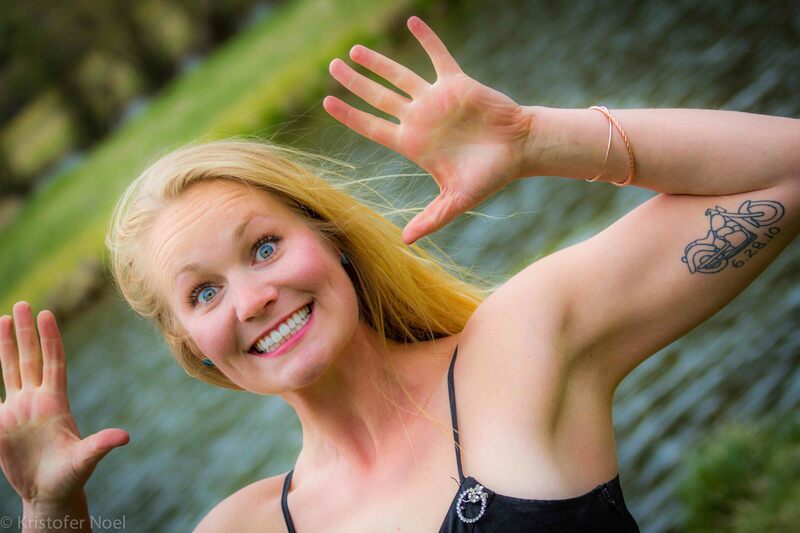 I took some straightforward shots as well as more playful shots, thanks to Natalie and Mark. 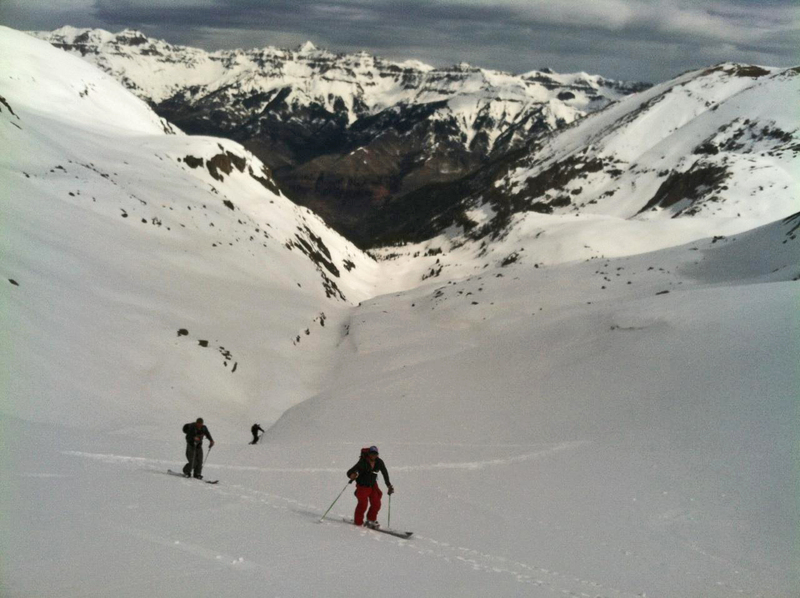 My first day skiing Telluride was in March of 2012. 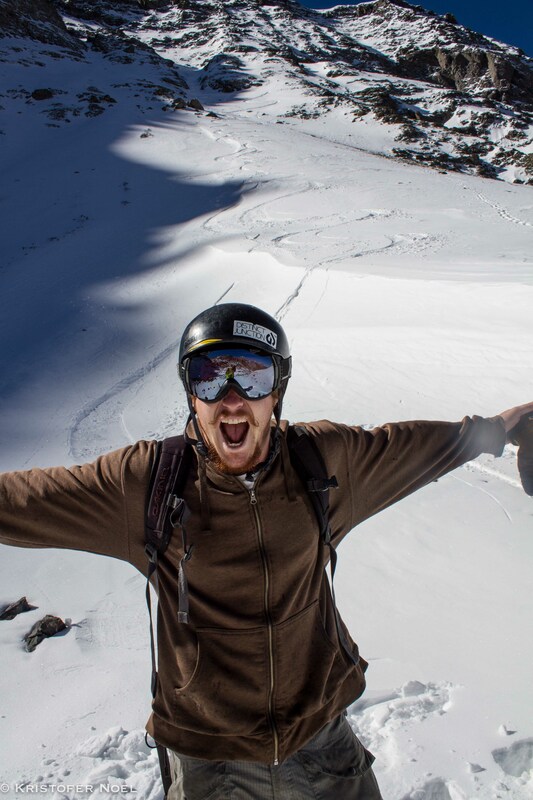 While I stood at the top of lift 14 taking in the surrounding beauty and endless terrain I quickly became captivated by the most aesthetic ski line I had gazed upon; The San Joaquin Couloir. Amongst a seemingly endless backdrop of mountains to explore in Bear Creek, the Joaquin seemed to stand alone. It was this initial view and the following days of skiing the resort and backcountry last spring that motivated me to move to this magical place. 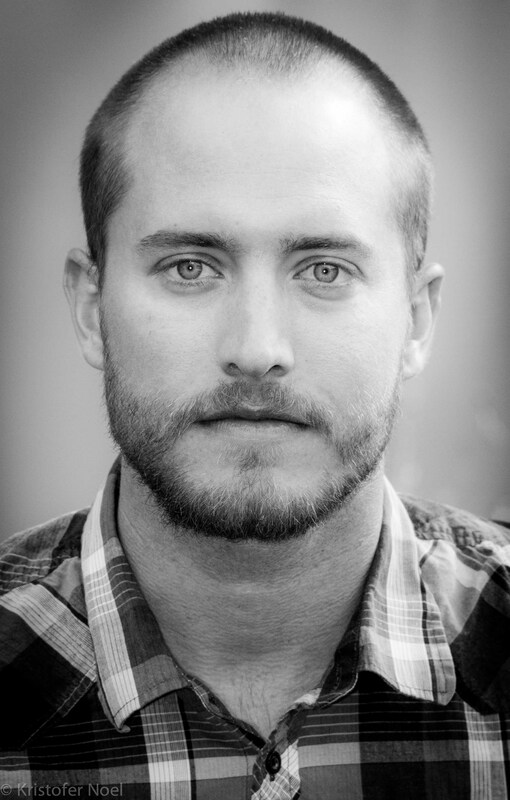 When my phone rang Thursday afternoon I was enthused to see “Aaron” pop up, I was in a meeting so I let it go to VM. If Aaron is calling generally it is in regards to a ski. Before the opportunity arose to check the VM a text came thru: “San Joaquin tomorrow…”. 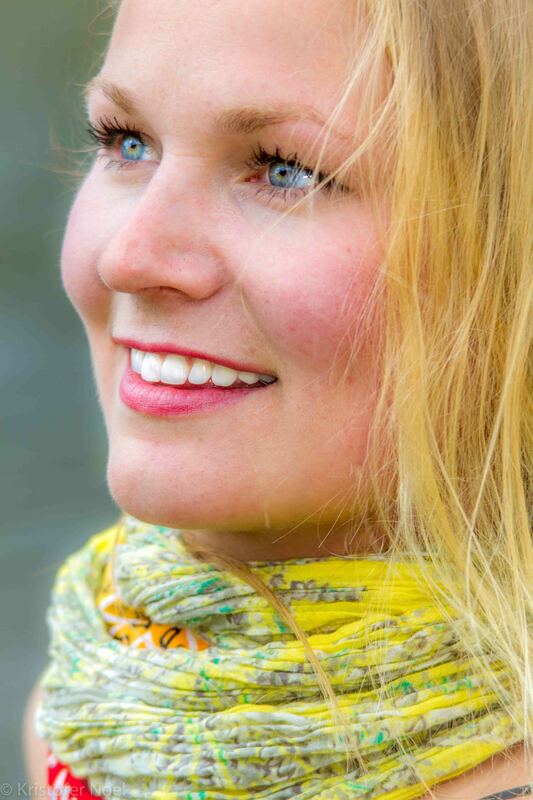 As my pulse quickened, my smile grew and my attention span for our meeting dwindled. Ironically we were off topic in our meeting discussing the accident that had taken place earlier that day in the San Joaquin. 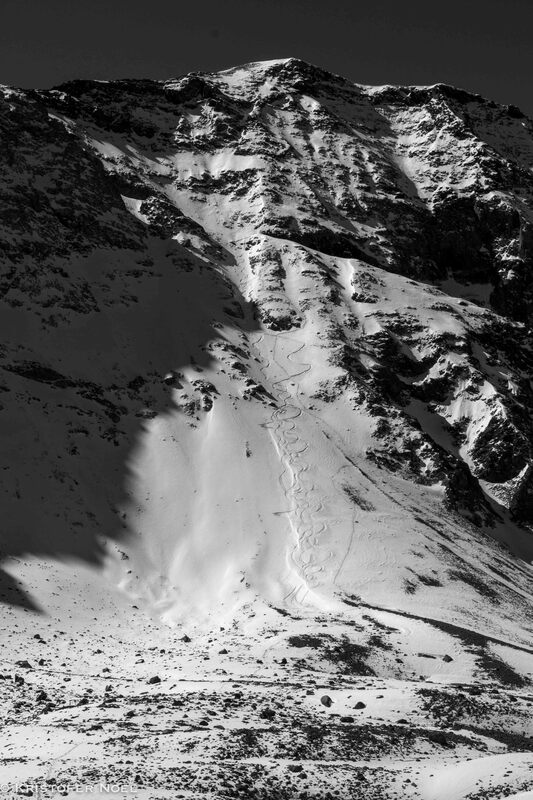 A local charger had taken a bad fall down most of the couloir and had just been picked up by the life flight helicopter. The timing of the text and our digression into positive thoughts for our fellow skier was somewhat creepy. None the less my excitement for the following days objective remained strong. 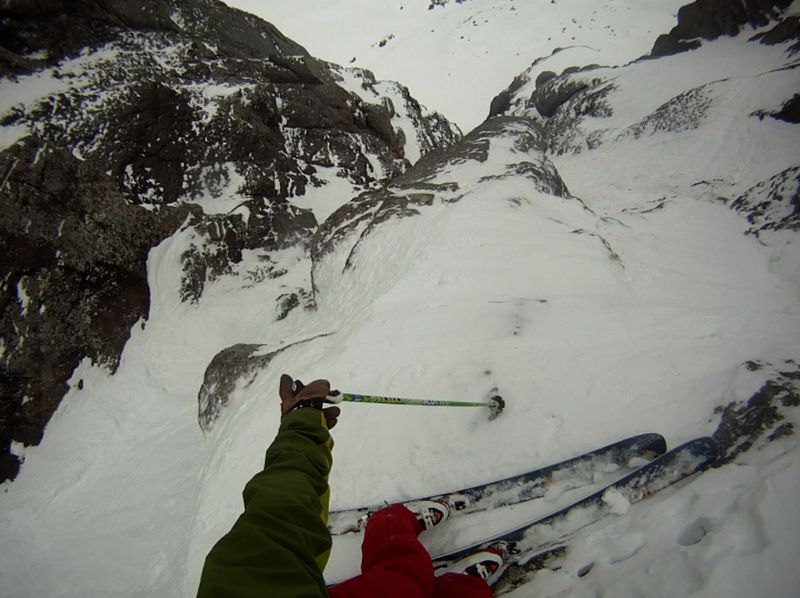 I had dreamed about skiing this line for almost a year. Arriving home it was time to crank up the tunes and gather gear. 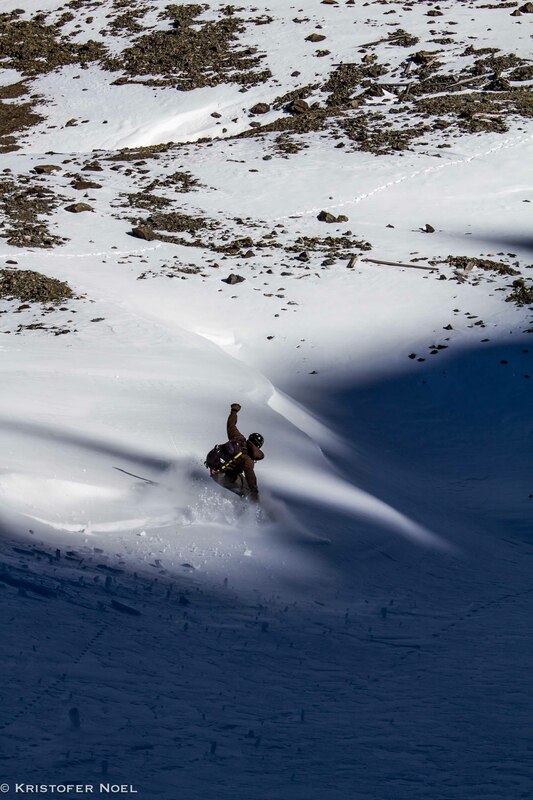 The season long reports were of sub-par conditions in the Joaquin: rotten snow, narrow chokes and rocks littering the couloir. We decided as a group that we would get on the first chair at 9am, leave the boundary of the resort and take a look. You don’t know unless you go. Aaron, Cody, Paul and I met Friday morning and headed for Gold Hill. We would be accessing the backcountry with the aid of chair lifts. With a simple duck of the ropes we were in the untamed backcountry and headed for our objective. 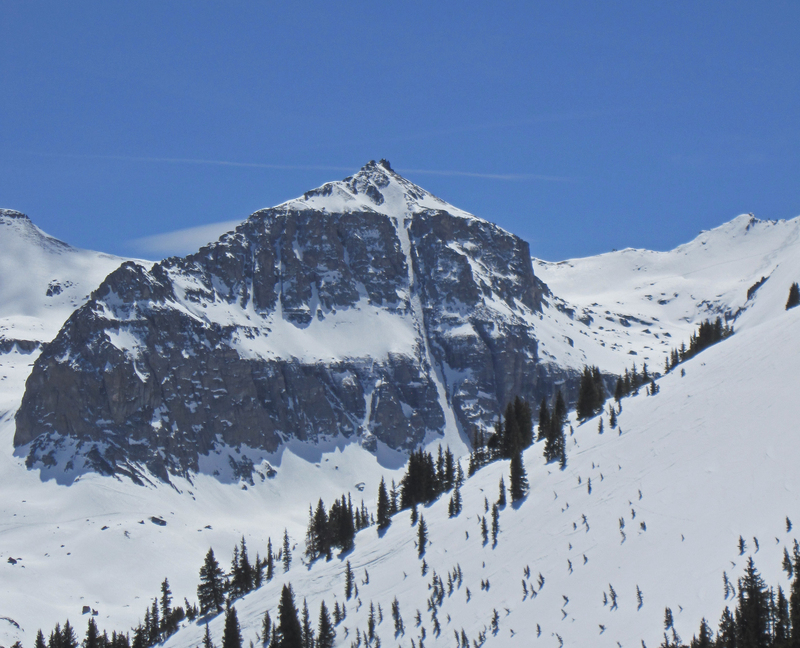 The initial ski out of the resort boundary was frozen supportable crust. Thursday had been warm and sunny, perhaps in the 50’s even at 12,000 ft or higher. It had gotten cold over night and the surface resembled frozen solid mashed potatoes. At the bottom of our initial ski towards Lena basin we donned our climbing skins on our skis and check to ensure that no fillings were lost in our dental work from the jarring conditions. 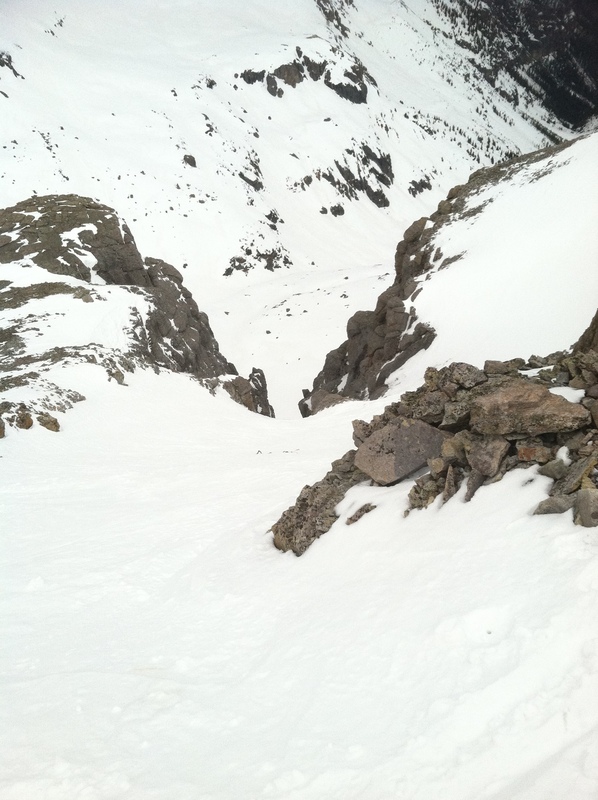 This basin would provide the approach to a ridge that would grant access to the couloir. 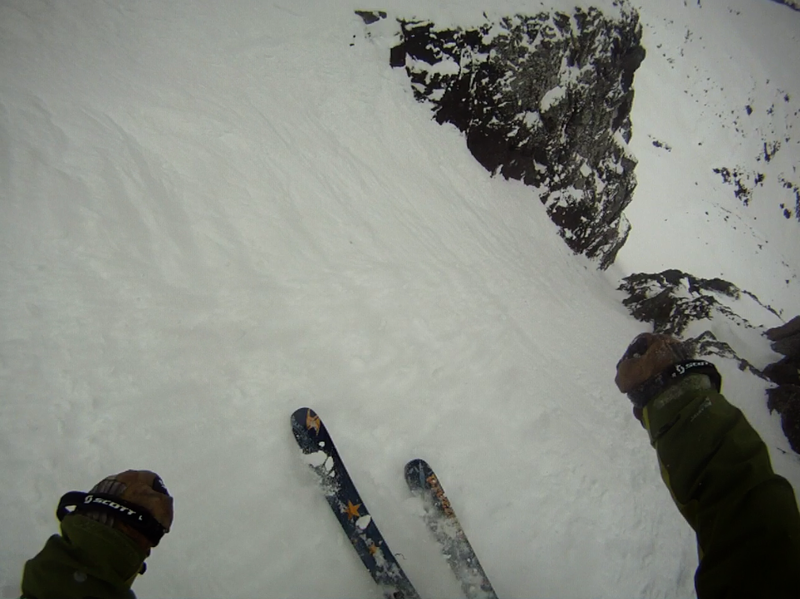 The skin was firm in spots, wind blown snow in others and down right punchy breakable layers in other spots. We joked about how variable the skin was and surely how interesting the ski would prove. Several “sucker holes” of sun poked thru the clouds. This provided both drastic changes in temperature from solar gain and also sun burn that became apparent the following day. The tranquility that is provided from the freedom of the hills is something difficult to translate into words. There are no rules, no boundaries, no one looking over your shoulder. It is freedom in the purest way possible. Natural law at it’s finest! After a few short meetings to discuss safety we approached the final ridge that leads to our objective. The weather was rolling in and swiftly. We could see snow engulfing the La Salle mountains in Utah. Dark ominous clouds settling in over the Sneffels range and high winds peppered our faces with graupel. A short few hundred feet of bootpack over frozen snow and rocks lead us to the entrance. We would have to move swiftly if we were to avoid the incoming weather. 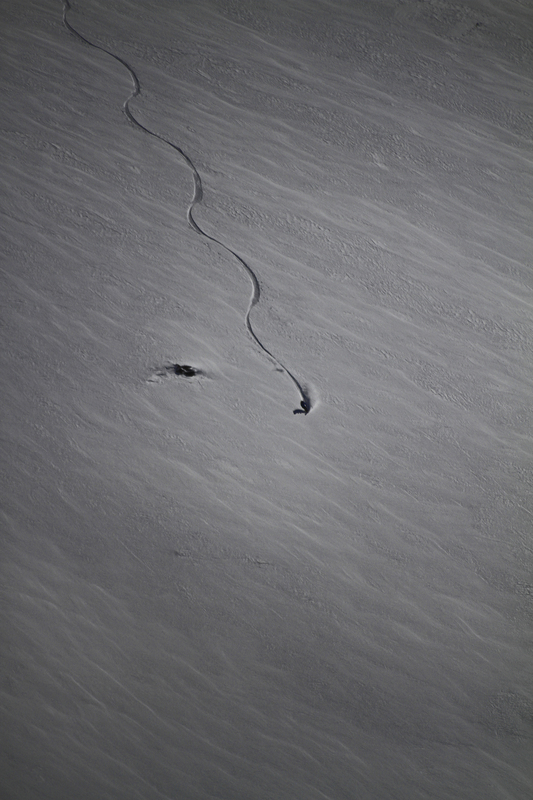 The snow in the entrance before the couloir was certainly open to accepting the edge of a ski and appeared to have a chalk like consistency as far as the eye could see. 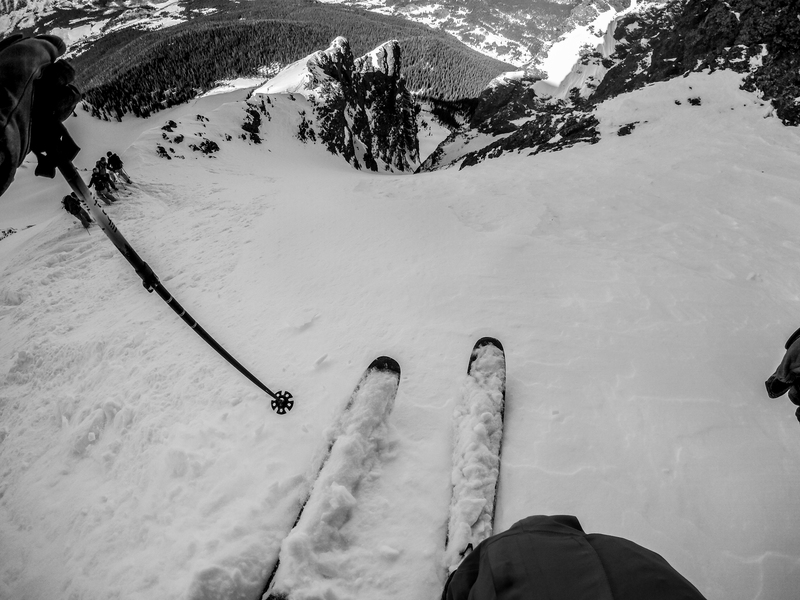 One of the interesting things about skiing chutes and couloirs is that most often there is a rollover that blocks your view of what lies below. We could tell the condition of the snow at the entrance, it was however impossible to see what lies below. 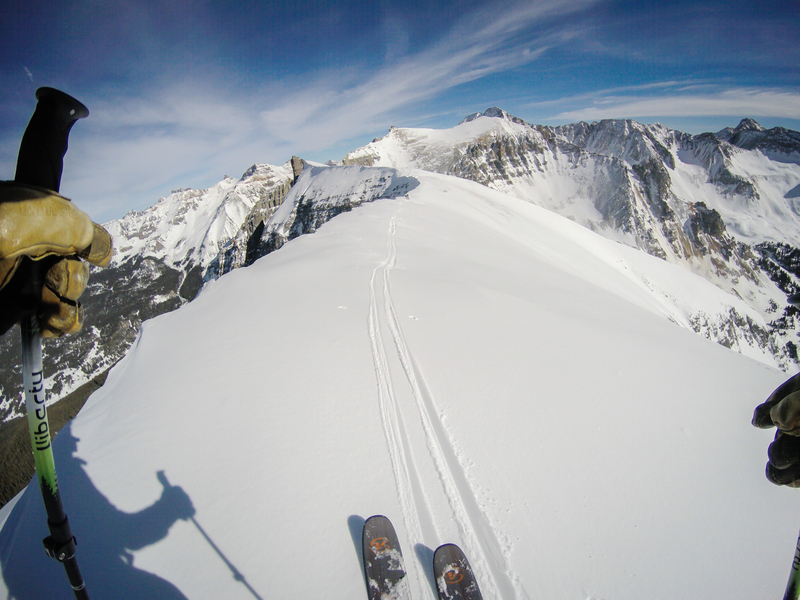 We clicked into our skis and began the descent into the San Joaquin Couloir at 13,460′ trying to stay one step ahead of the incoming weather front. 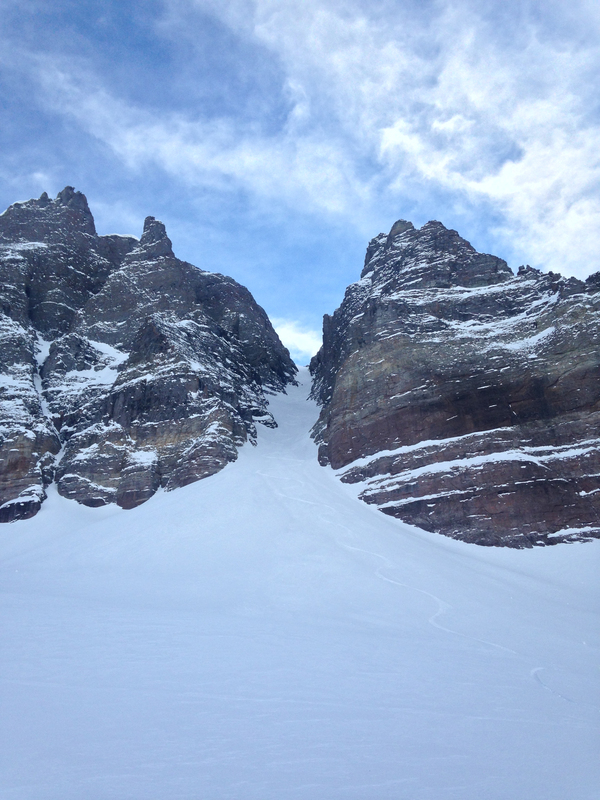 The first turns proved to be lovely skiing with wind blown snow resting atop firm chalk like wind affected happiness. 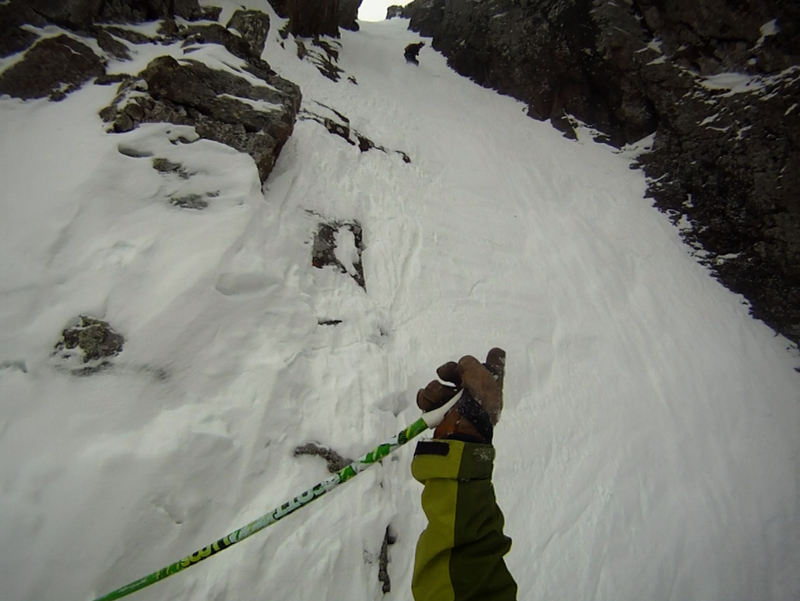 Getting into the couloir; anxiety morphs into concentration as I lead the way. The snow remained chaulky fun. 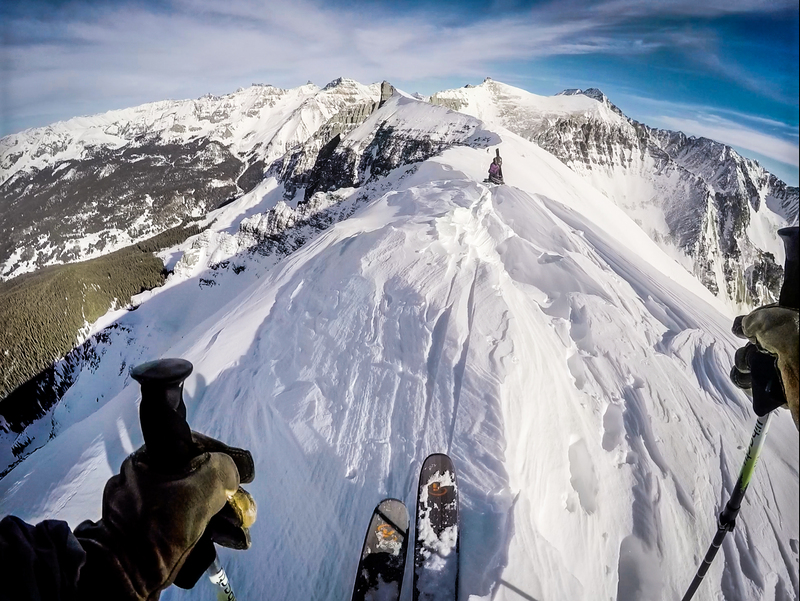 The angle increases as the couloir narrows, this is truly where the fun begins and where the entire experience leaves reality behind and becomes surreal. I feel like I am both living each turn and feeling each turn in a deeper spiritual existence. This is why we hike, skin and scramble across rock. There is nothing other than the moment I am living, existing and concentrating on each turn. I get lost in the calculated action of completing turn after turn knowing that falling is not an option. Peaceful bliss, I feel this is where I belong. I pulled into the first “safe zone” and waited for the first of my partners to come down. Paul made effortless turns down to me, I can feel the joy radiate as he gets closer. This was the first descent for Paul as well, the excitement was palpable. I enjoyed watching Paul make turns almost as much as I enjoyed my own turns. Once Paul was in the “safe zone” I began making my way through the choke as Aaron and Cody began their way down. The choke usually has two options, one left of the spot I stood and one right. It is not possible to see this choke from above and one can only speculate from a vantage earlier in the day, one ridge away as to what the conditions of the choke would bring. 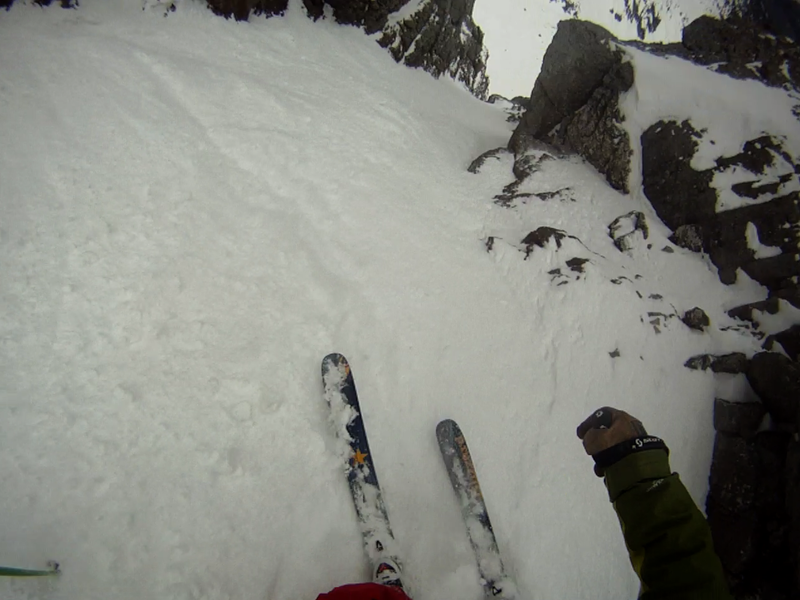 The option skiers left proved to be a mere 2 to 3 feet wide and impassable for mere mortals. 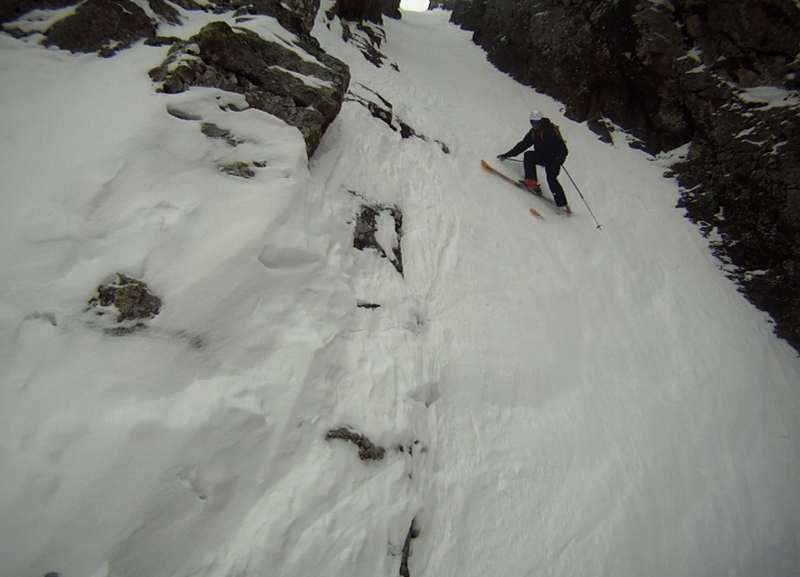 The option right seemed to have more rock than snow however it provided an ample width, at least it was wider than my 185cm skis are long, a good start. 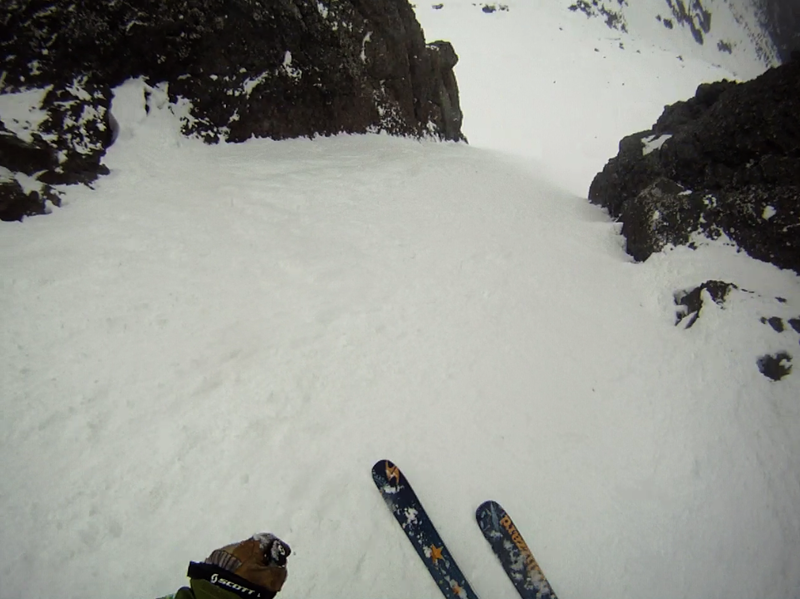 This first choke lies approximately 1/3 of the way down the couloir. It was time for me to move as Paul, Aaron and Cody would need to move onto the valued albeit precarious piece of real estate I was perched upon. A quick glance back to the boys who have now moved to where I just was. Glad to be done with that first rocky crux I point the tips down the fall line, looking forward to turns to come. Just below the choke held lovely skiing. Soft, steep snow leading to the next narrows. Working my way thru the second choke. 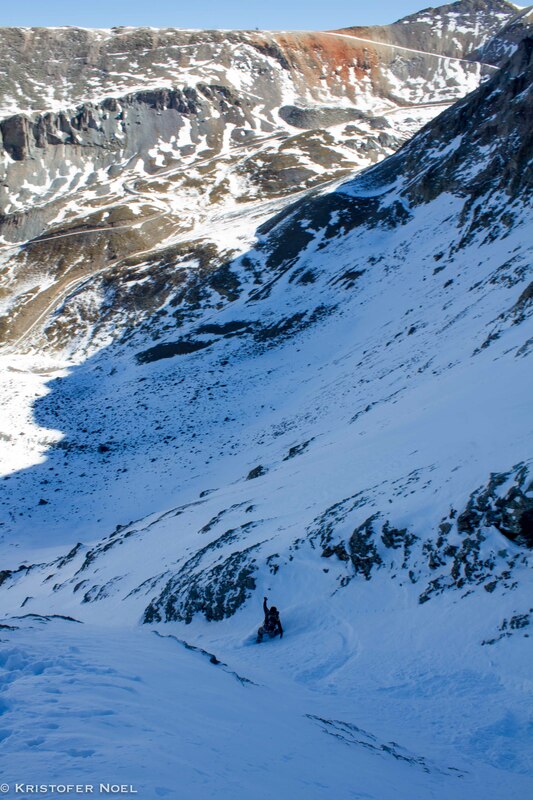 The apron below the couloir is now in sight, The slope becomes slightly more steep as it also becomes more narrow. Total concentration, total bliss. Below the final choke things open up, the angle relaxes and the snow becomes soft and playful. I began to feel the joy of accomplishing a goal building inside. I let out a bellowing laugh and a scream of joy. I let gravity do it’s part and began to build speed, confidence grew as I sped towards the apron. Pulling into the apron my body and mind remained synched. Physical and mental joy were harmonious and my smile uncontrollable. 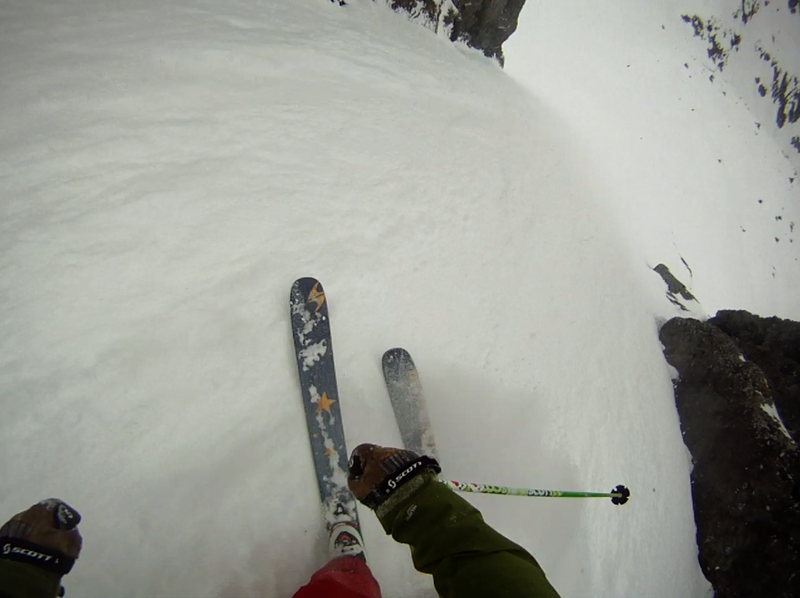 I had skied the line that caught my eye and my heart nearly one year before. It wasn’t that I had done something no one else had done before; many people have skied this, will ski this and likely will have far better conditions that we did; it was that I had completed a goal with friends, safely amidst sub par conditions. With the right approach anything is possible. Looking back up. Paul is a tiny black spec up there. 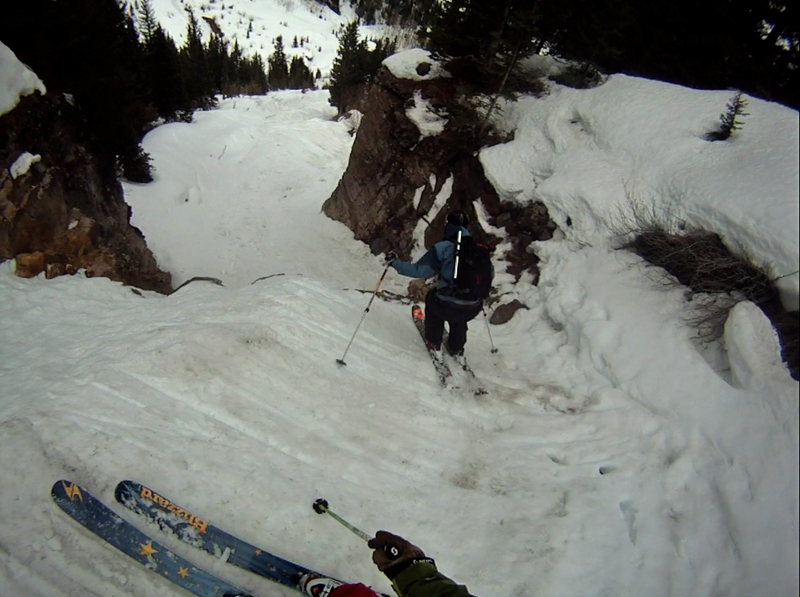 We got some nice turns on the following two chutes back towards the Town of Telluride. Wind had done it’s thing and filled in the lower elevation and lower angle runs below. 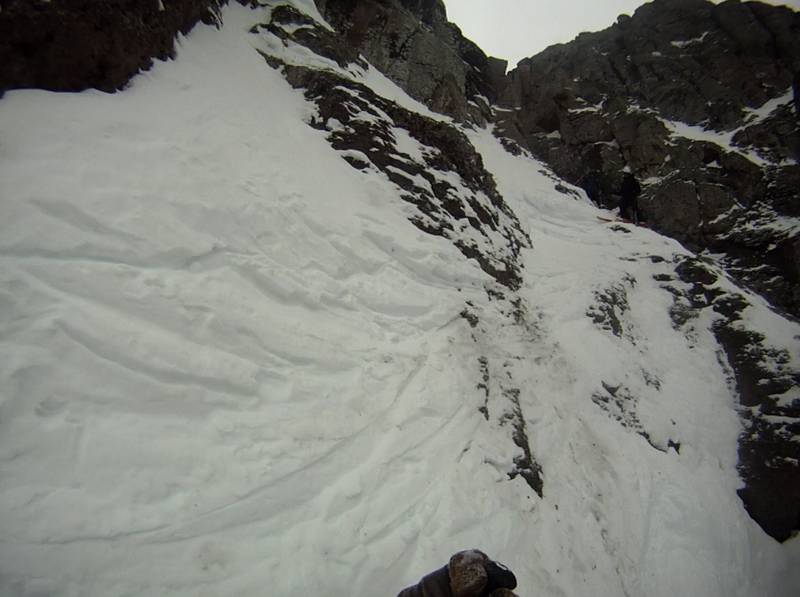 The final chutes down below the Bear Creek Falls proved interesting as each required a mandatory air onto flat and firm snow. Aaron puts his drink order in over the small air: “margarita rocks salt please”. I second that order and take the last little drop towards our celebratory drinks. 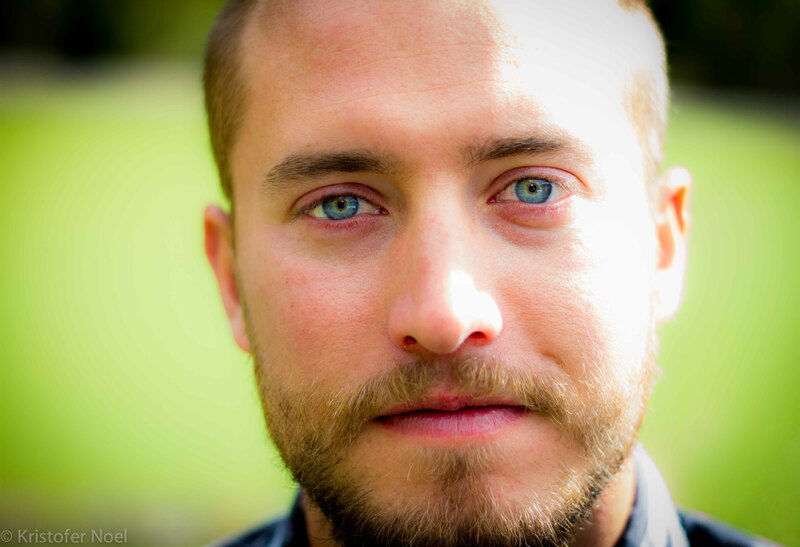 Thanks to Cody, Aaron and Paul for a great day. 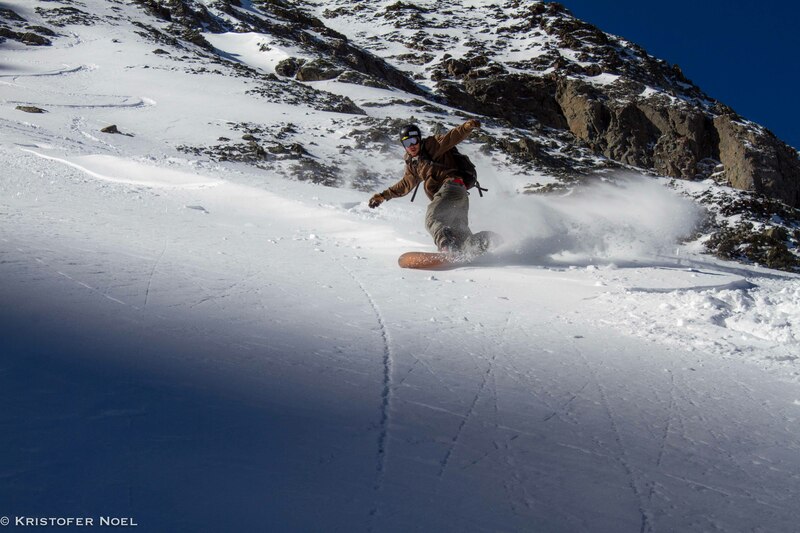 Until next time, may your turns be soft and deep.